Mukherjee, A., B. Esfandiari (Babak) and Arthorne, N.
A simple method is proposed for peer-to-peer description and discovery of resource-sharing communities as well as the resources themselves. An XML Schema document describes a shared resource. By applying transformations, specified in XSL, the schema is used to generate an application with the ability to publish and search for the defined object. Meta-data is indexed and searchable allowing complex objects to be discovered. We propose to solve the problem of discovery for resource-sharing communities by treating a community as a shared resource. 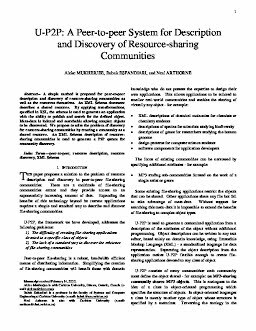 An XML Schema description of resource-sharing communities is used to generate a P2P system for community discovery.